Sprouts are known as a ‘wonder food’ and have been studied for centuries because of their high levels of phytochemicals that have shown to prevent and treat life-threatening diseases including cancer. It’s been said that broccoli sprouts for instance, are far more nutritious than full grown broccoli. * There are many types of sprouts out there. 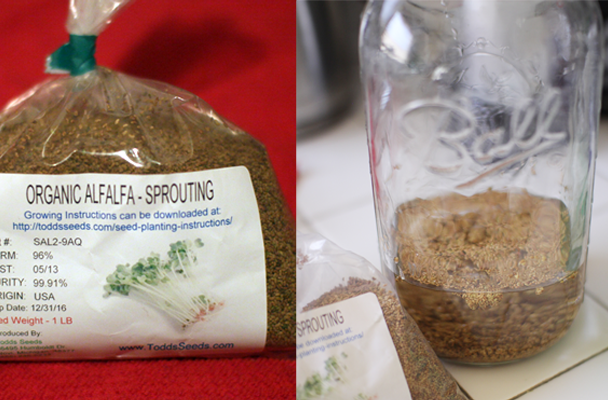 I’ve been happily growing alfalfa sprouts in my own kitchen as you will see below (so easy!). Cooking and processing food destroys many micro nutrients by altering their shape and chemical composition. And the sprouting process tends to increase nutrient content and bio-availability of nutrients in raw foods. The content of vitamins and essential fatty acids also increase dramatically during the sprouting process. For example, depending on the sprout, the nutrient content can increase as much as 30 times the original value within just a few days of sprouting.Sunflower seed and pea sprouts tend to top the list of all the seeds that you can sprout and are typically each about 30 times more nutritious than organic vegetables you can even harvest in your backyard garden. During sprouting, minerals, such as calcium and magnesium, bind to protein, making them more bioavailable. Sprouts are the ultimate locally-grown food, and can easily be grown in your own kitchen, so you know exactly what you’re eating. And since they’re very inexpensive, cost is no excuse for avoiding them. So as you can see, sprouts are extraordinary for your health and are far more nutritious than regular greens. With sprouts you get and ample supply of phytonutrients, enzymes, amino acids (for building protein), chlorophyll, biophotons (a.k.a life force energy) and other trace nutrients. The reason for this abundance of nutrients is because the first few days of a plant’s life is a time of incredible energy and a microscopic storm of nutrient-making activity. By consuming sprouts, you are transferring the concentrated vibrant life of the young plant into your body. Some people will drink the soak water as it contains enzymes (made of amino acids, the building blocks of protein) that are released by the seeds. Lemon or apple juice added to the enzyme-rich soak water make it taste better. You don’t need anything special to grow sprouts, all it takes is something like a big glass jar and a screen (or mesh cloth) to cover the top. 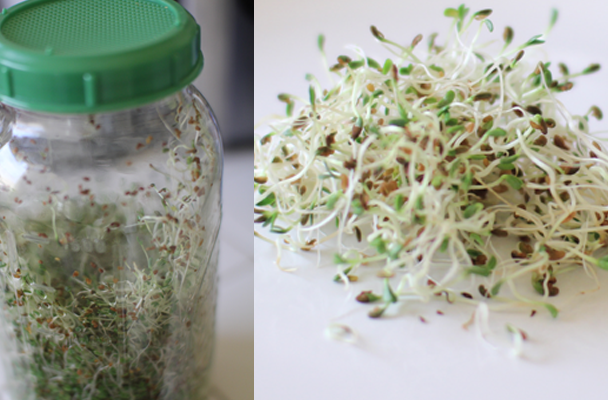 A common method of growing sprouts is to use a big jar covered by a screen, and keeping the jar tilting almost upside down at an approximate 45 degree angle tin a big bowl to drain excess water. The steps are easy. Simply soak the seeds over night, pour out the water the next day and let the seeds sit. Then you rinse the seeds every day, and watch them grow! Depending on the temperature, it takes only about 3-4 days until the small green leaves grow out, that’s the part you want to eat. You can buy alfalfa sprouts online. I buy mine from toddsseeds.com. Two of the easiest and most efficient ways to optimize your vegetable intake is to juice your vegetables and add sprouted seeds. Sprouts-as-medicine.com is a good source for info on sprouts: their health benefits, recipes, and how to grow your own. * According to Paul Talalay, M.D., in the American Cancer Society NEWS, ‘brocolli sprouts are better for you than full-grown broccoli, and contain more of the enzyme sulforphane which helps protect cells and prevents their genes from turning into cancer.’ His findings are consistent with several epidemiologic studies that have shown that sprouts contain significant amounts of vitamis A, C and D. Sprouts are widely recognized by nutrition-conscious consumers and health care professionals as a ‘wonder food.” –Good Sprout News of the International Sprout Growers’ Association; ISGA-Sprouts.Org.